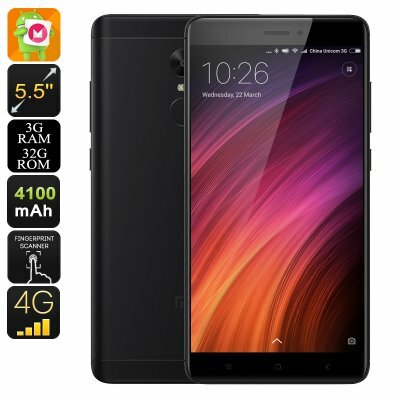 Successfully Added Android Smartphone Xiaomi Redmi Note 4X - 5.5 Inch FHD, SnapDragon 625 CPU, 3GB RAM, 2GHz, Fingerprint, Dual-IMEI (Black) to your Shopping Cart. If you are looking for a relatively cheap smartphone that comes packed with the latest hardware and software alike, the Xiaomi Redmi Note 4X is the ultimate mobile phone for you. Running on the MIUI 8 operating system that comes packed with all the latest Android features available, this Android phone is guaranteed to deliver a smooth user experience. With Dual-IMEI numbers and 4G support, this smartphone brings along great connectivity. Browse the web at lightning speeds, download files in the blink of an eye, and always stay within reach for friends and family – with this Android phone you’ll always stay connected. Packed within its sleek body, this mobile phone holds a beautiful 5.5 Inch Full-HD display that portraits all your favorite media in crisp 1080p resolution. Enjoy movies on the go, play games, or simply browse the web – with this Android phone at your side, you’ll always be treated with outstanding visuals, details, and vivid color. Thanks to its epic 4100mAh battery, this mobile phone lets you enjoy all its amazing features throughout the most demanding of days without you needing to fear about running out of juice. With respect to its hardware, this affordable Android phone holds some serious power. Coming with the Snapdragon 625 CPU – an Octa-Core processor that has been clocked at 2.0GHz – this amazing Android mobile phone is guaranteed to handle your toughest demands without dropping a frame. Add to this the phone’s 3GB of RAM, and you’ll be ready to engage in excessive multitasking sessions, play graphically demanding games, and enjoy the latest applications without ever needing to worry about slowing down your Android device. Supporting 32GB of internal memory and having the additional option to throw in a 128GB SD card, this Android phone is guaranteed to hold all the space needed to store your media and files. Accessing these files has never been easier as, at the rear of this beautiful Android phone, you’ll be able to find a top notch fingerprint scanner that lets you access your phone in a split second. Above this scanner, the phone holds a high-end 13MP camera fit for shooting breathtaking pictures and video of all your upcoming holidays and nights out in town. The Xiaomi Redmi Note 4X Android Smartphone comes with a 12 months warranty, brought to you by the leader in electronic devices as well as wholesale electronic gadgets..